Over the summer I will be thinking about what classroom management ideas I want to use again next year. 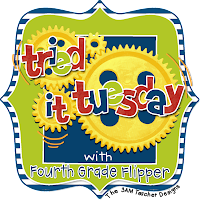 Today I'm linking up with Tried it Tuesday from Fourth Grade Flippers to share an iHelp board I made last year. 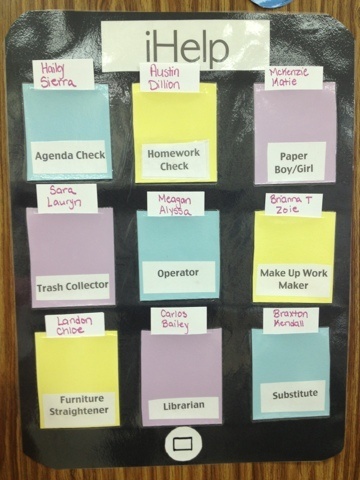 I found this idea for keeping up with classroom jobs on Pinterest and decided to try it myself. My students thought it was cute because they all love their iPhones and iPods. I really liked it because it was very easy to change their jobs each month. I kept index cards with the names of students in both of my two classes and could easily see who had already had a job in prior months. I'm sure you can figure out how to make this just by looking at the picture. The pockets may be the trickiest part but all I did was fold cardstock into a pocket and glued down one side. I then laminated the entire poster and went back and cut slits in the tops of the pockets so that the index cards could slide through. The best thing about this poster is that it is still in tact and ready to use next year. All I have to do is make new index cards with my students names on them. 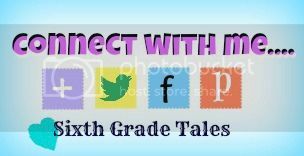 I also am linking up with Tori's Teacher Tips for a Bloglovin linky. I will miss using google reader but Bloglovin seems pretty neat. Make sure you click the button below to follow me & stay updated! 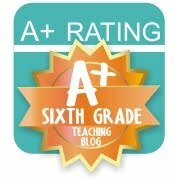 Also, make sure to visit Tori to find some other awesome teacher blogs to follow! I love how you can easily see who has had the job previous times! I am following you on Bloglovin' and thanks for linking up!